Having lived out of a suitcase for the last three years, Peter Clark has been touring and guest-directing ensembles worldwide. His first performances in Carnegie Hall were with the Australian Chamber Orchestra when he was still too young to legally drink wine afterwards. Since then, highlights have included Peter performing chamber music at Denmark’s Thy International Chamber Music Festival with Máté Szűcs, principal violist of the Berlin Philharmonic. 2016 brought him to Ireland where he was principal second violin of the RTÉ Symphony Orchestra, Dublin. During 2017, he was in residence at Lincoln Center, New York. 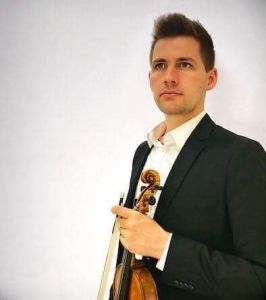 In 2018, Peter appeared as concertmaster of the Darwin Symphony Orchestra. He recently appeared as concertmaster for Handel in the Theatre’s production of Susanna, to critical acclaim. For the last three years, Peter has created and developed a widely acclaimed interdisciplinary concert experience entitled ‘Local Heroes’, with the Australian Chamber Orchestra. Together with violinist Pekka Kuusisto, Peter has delivered ‘Local Heroes’ to thousands of young people all across Australia. Peter has performed with early music groups Pinchgut Opera, Australian Romantic and Classical Orchestra, Ludovico’s Band, Orchestra of the Antipodes, Ironwood, amongst others. A proud Tasmanian, Peter spent his childhood busking at Salamanca Market, saving to buy his first baroque bow!